Basic day to day management of health and safety within a car dealership is a tough job. There are so many complex issues and challenges it is easy to see why health and safety is often swept under the carpet until something serious happens. In this article, we discuss why strong leadership is so important to ensure the safety and health of your workforce. 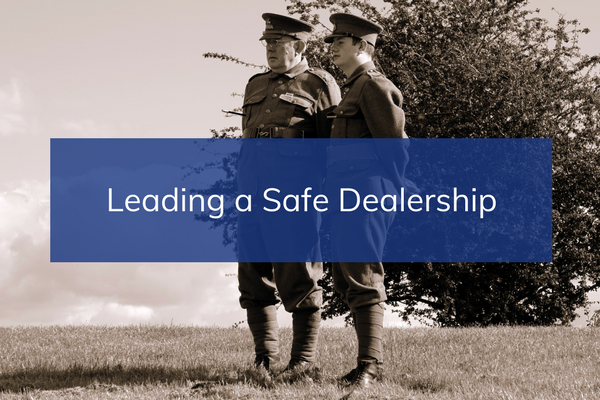 The only way that a positive health and safety culture can be embedded into the foundations of your dealership business is through a strong leader who fully grasps the tasks at hand, leads by example and delegates tasks to their workforce. This is easier said than done. Many business heads have been promoted through the ranks, developing strong management skills but not fully embracing the broader context around occupational safety and health. There was a time when simply complying with the law was enough, but leaders now need to develop sustainable business practices and responsible behaviours to drive a culture of health and safety throughout the business. Building capability and culture with clear and strategic vocational health and safety objectives will, without fail, make sure that the dealership becomes more effective, efficient and above all, safe. The key to successful capability building is to diagnose systematically, design solutions and deliver change to address performance issues within the business. True leaders can look at current resources and identify areas of weakness in terms of health and safety capability. This doesn’t just mean in terms of staff knowledge but in areas such as skills, processes, tools and systems that will be required to drive health and safety forward. In terms of the workforce, if the capability is there it will just need nurturing to enable it to continue to grow. However, if there is an obvious skills gap, the leader needs to take control. The ‘Plan Do Check Act’ process is a powerful four-step management method to help leaders identify skills gaps and foster continuous improvement of processes. Failure to ensure that senior managers have the ability, knowledge and confidence to influence health and safety change will make the system fail from the outset. The organisation, at board level, needs to analyse the senior management team and assess their competency to carry out this responsibility to ensure effective health and safety management from the top down. For those leaders who do not yet possess adequate skills, the IOSH Leading Safely course is ideal. It’s a short course designed for anyone in a senior management or leadership role, to help them understand the true value of health and safety and give them the ability to drive change through the day to day activities of the dealership. • Leaders delivering projects to rebrand health and safety within the organisation to realign it with the business development strategy. • Leaders implement a deputy health and safety co-ordinator in their dealership to delegate responsibility and upskill the workforce. • Personal commitments by leaders to attend all interviews for new starters to ensure that the organisation’s commitment to health and safety is understood from the outset. Leaders need to be skilled and empowered to drive forward change in their individual dealerships and given the resources to improve the capability of their teams. Ensuring that continuous health and safety improvement is a formal objective of the business provides the business case for senior managers to motivate their teams. To find out about more about driving cultural change in your organisation, or for information on the IOSH Leading Safely course, get in touch by calling 0161 486 5020, 0203 1264 997 or emailing us at [email protected].